His Highness Sheikh Hasher Al Maktoum bin Maktoum, Director General of Dubai Information Department, in a speech given on behalf of His Highness Sheikh Hamdan Bin Rashid Al Maktoum, Deputy Ruler of Dubai and Minister of Finance and Industry, said that the strategic location of Dubai and the absolute confidence in its ability as a starting point for many initiatives of the countries of the Arab nation, urge it to examine everything that is new for the advancement and development of society. The United Arab Emirates always aspires to be the pioneer in providing assistance and support for all peoples, he added. That was part of the speech of Sheikh Hamdan which was delivered on Tuesday during the opening ceremony of the 2nd Arab Conference for Genomic Studies and Genetic Disorders, held under his patronage, at Al Bustan Rotana Hotel in Dubai. It was organized by the Arab Center for Genomic Studies of the Sheikh Hamdan Award for Medical Sciences, in cooperation with the Islamic Affairs Department and Charitable Activities in Dubai. HH Sheikh Hamdan’s speech explained the challenges we are facing in dealing with genetic disorders, which do not discriminate between rich, poor, developing or developed countries, as they exist in every time and place, and constitute major challenges that force us to bear in mind the necessary programs and proper planning to meet these challenges that affect directly the progress and development of societies. The speech acknowledged the guidance of His Highness Sheikh Khalifa Bin Zayed Al Nahyan, President of the State (may God preserve him) and the instructions of his brother, His Highness Sheikh Mohammed Bin Rashid Al Maktoum, Vice-President of the State, and Prime Minister of the Council of Ministers and Ruler of Dubai (may God preserve him), and their brothers Their Highnesses the Supreme Council members of the Union and Rulers of the Emirates, in developing UAE society. There was strong emphasis on the fact that the United Arab Emirates is keen for the development and progress of society in all fields and is always eager to contribute actively in the field of development and growth with all available appropriate means. He asserted that this conference, which includes the attendance of distinguished scientists, doctors and pioneers in the field of genetics, is the door for all those in the world who are interested in the subject of genetics to discuss and follow up the latest developments and programs that can be taken advantage of to build upon them in dealing with these disorders. In his speech, His Highness thanked the Islamic Affairs Department and Charitable Activities in Dubai on its fruitful cooperation with the Arab Center for Genomic Studies and for its participation in the global gathering to assess the perceptions and recommendations in the light of morality and legitimate means, in order to serve the areas of scientific research in genetic disorders. The proceedings of the Conference which aims at the definition of genetic disorders prevalent in the region and the methods that can be used to control and prevent them, began with the opening ceremony at 9:00 am yesterday in Al Rashidiya Ballroom, Al Bustan Rotana Hotel, Dubai. It included a speech by His Highness Sheikh Hasher Al Maktoum bin Maktoum, Director General of Dubai Information Department, a speech by His Excellency Humeid Al Quttami, UAE Minister of Health, Chairman of the Award Board of Trustees, another presentation by Dr. Hamad bin Al Shaikh A. Al Shaibani, Director General of the Islamic Affairs Department and Charitable Activities, and a final speech by Dr. Najib Al Khaja, Secretary General of the Award, President of the Center for Arab Genomic Studies. 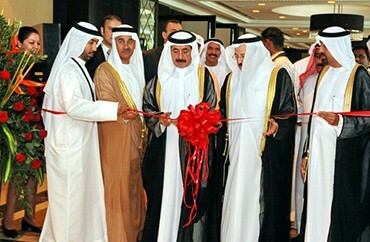 An exhibition accompanying the activities of the conference was then inaugurated. His Excellency Hamid Al Qatami confirmed in his speech that Inherited Genetic Diseases are a serious health dilemma, and must be taken into consideration particularly because there is no current database to exchange experiences or to document sick cases in the Arab World. That was why Sheikh Hamdan bin Rashid Al Maktoum Award for Medical Sciences is concentrating its efforts and is drawing up suitable scientific and practical plans to support and develop knowledge in the field of human genetics sciences, not only in the United Arab Emirates, but in other Arabic countries as well, he said. In his speech, Dr. Hamad Al Shaibani noted that the gene revolution and the spectacular discoveries in the area of gene therapy should be infused with ethical standards, especially since we know we are dealing with an area that leaves genetic fingerprints affecting the present and future generations. Dr. Najib Al Khaja, Secretary General of Sheikh Hamdan Award for Medical Sciences, pointed out that the attention given to genetic studies has reached high levels with large financial budgets, the buildup of new institutes and the training of new scientists in the subject. Geneticists have won many recent awards for their work, the best example being the Nobel Medical Award which was given to some scientists in the domain of genetic sciences. He said that the conference is the second one on behalf of the center, and it is a completion of the first conference which was held two years ago in which the first structure for joint Arab action was established. It was the founding of the Arabic Council for Genetic Sciences, which became the most important representative from the area in the field at many international forums, and contains the finest doctors in the Arab world in many specializations. The council, since it was founded, has initiated many scientific events, which add value to the center's activities. This conference focused on discussing the methods of preventing genetic diseases, in addition to discussing the ethical sides of this domain. The opening ceremony was followed by a general seminar that discussed the 'Ethical Anticipation of Human Genetics Studies Applications in the Arab World.' It was held in collaboration with the Islamic Department Affairs and Charitable Activities in Dubai. A large number of scientists and physicians participated in the symposium that was divided into two sessions. Dr. Ahmad Abdul Aziz Al-Haddad, Chief Mufti, Bureau of Islamic Affairs and Charitable Works in Dubai, shared the same session which discussed the genetic disorders and congenital abnormalities that continue to be serious issues faced by healthcare providers in the Arab World. The aim was to arrive at conclusions and recommendations that could help Arab societies in the field of genetics. The proceedings of the 2nd Arab Human Genetics Conference which will continue on Wednesday 21 and Thursday 22, November, also include 6 specialized scientific sessions where 27 specialists will lecture in the fields of genetics. They hail from the United Arab Emirates, Saudi Arabia, Bahrain, Oman, Qatar, Jordan, Lebanon, Egypt, Tunisia, Finland and the United States of America. Wednesday the discussion proceeded with the first session about the Human VARIOME Project (genetic variation), while the second session will focus on the Complex and Recessive Disorders in the Arab World and the third session will hold a discussion on the new research on genetic disorders in the region. On Thursday November 22nd, the working sessions will proceed further with the fourth session that will discuss the subject of Bioethics and Genetic Humans, and International Bioethics and Human Genetics. The fifth session will be dedicated to discuss the national strategies for the prevention of genetic disorders in the region through a presentation of Al Bahrain Prevention Strategies of Genetic Disorders (1984-2007), and Jordan's National Strategy for Prevention of Genetic Disorders and Congenital Abnormalities, and the results of Newborn Screening in Saudi Arabia, Lebanon and Egypt. The sixth session, which is the last session, will hold short lectures discussing a variety of subjects like the Degradation of Mutated Proteins and the cause of Genetic Disorders, and the Molecular Analysis of Hemophilia disease in Lebanon and the Most Prevalent Genetic Disorders in Egypt.